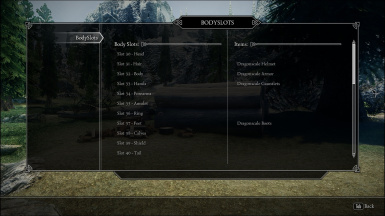 It's a simple Mod that show the body slots you are using via MCM. Its a simple Mod that show the body slots you are using via MCM. I think this is pretty useful for people who likes to wear tons of outfits and armors and don't know what slots are left. v0.3 - Added a new tab View items. v0.2 - I fixed an error with the array. Papyrus log should be free of errors now.